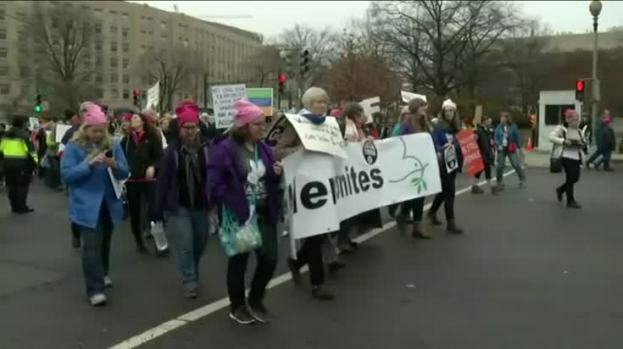 Thousands of people turned up for the Women’s March in Washington, D.C. Organizers this year had estimated half a million people could attend but the turnout was expected to be much lower. Amid internal controversies and a capital city deeply distracted by the partial government shutdown, the third Women's March returned to Washington on Saturday with an enduring message of anger and defiance aimed directly at President Donald Trump's White House. The original march in 2017, the day after Trump's inauguration, flooded the city with hundreds of thousands of people. The exact size of the turnout remains subject to a politically charged debate, but it's generally regarded as the largest Washington protest since the Vietnam era. In November, Teresa Shook, one of the movement's founders, accused the four main leaders of the national march organization of anti-Semitism. The accusations of anti-Semitism were crystallized in an article written in the Tablet in December. The magazine reported that in an initial planning meeting, Tamika Mallory and Carmen Perez, two of the Women's March Inc. leaders, said that Jewish people had "a special collective responsibility as exploiters of black and brown people." Mallory and other leaders deny the statement. In addition, Perez, Mallory, and Linda Sarsour's association with Nation of Islam minister Louis Farrakhan, who has a history of making anti-Semitic and anti-LGBTQ comments, led to more criticism. The New York Times reported that Mallory and Perez said, "they work in communities where Mr. Farrakhan is respected for his role in rehabilitating incarcerated men. They attended the 20th anniversary of the Million Man March in 2015, which Mr. Farrakhan planned." Shook, a retired lawyer from Hawaii, has been credited with sparking the movement by creating a Facebook event that went viral and snowballed into the massive protest on Jan. 21, 2017. In a Facebook post, she claimed Sarsour and Mallory, along with fellow organizers Bob Bland and Carmen Perez, had "steered the Movement away from its true course" and called for all four to step down. The four march organizers have denied the charge, but Sarsour has publicly expressed regret that they were not "faster and clearer in helping people understand our values." Additionally, in a later interview with a radio station called Breakfast Club, Mallory unequivocally condemned antisemitism. There are many women's marches across the country that are unaffiliated with Women's March Inc. 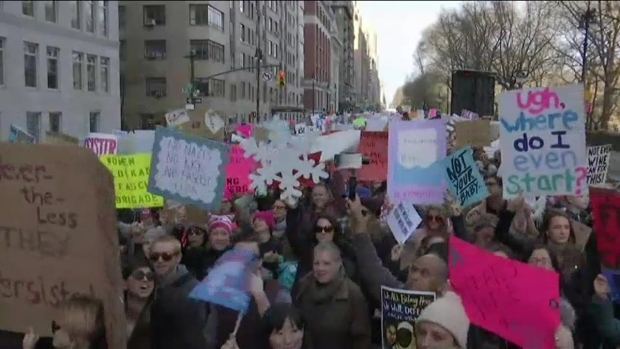 In New York City, an organization called Women's March Alliance plans the massive march which stretches along Central Park West and has done so since 2017. Roxanne Gonzalez-Mcgibney, who has participated in the march each year, said, "I chose to come to the Women’s March Alliance because it was not associated with the anti-Semitic allegations. I do not like the anti-Semitic comments but I also think it is important to make sure that we continue the movement and address the things that are important to women. We cannot ignore the whole movement because of some problematic issues that a few people in the movement have had." Hannah Simpson, a transgender activist who spoke at the Women’s March Alliance Saturday, wants to make sure that the movement is bringing people together. She told NBC, "I do not want to think about the anti-Semitic allegations anymore while I am here today. All that is doing is diminishing the voice and the footprint of women. We should singularly be focused on Donald Trump and everything that he stands for." A city official in Washington says the turnout estimate for the Women's March on the National Mall now stands at 500,000 people. That's more than double the initial predictions. While the turnout for this year’s march might have been smaller than in previous years, the energy was equally high. 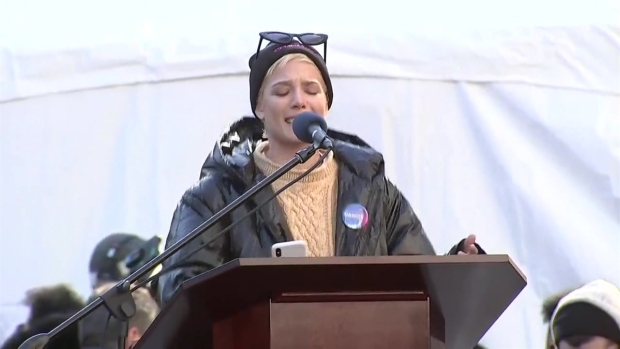 "All of these people congregate today to show solidarity," said Lauren Ash, a volunteer for Women’s March Alliance and the master of ceremonies for the march. "We have made progress but we still have a long way to go. We are here, registering voters, showing up, and making sure everyone is remaining active. That is what the women’s march is about." Zoe Heath, a student at Sussex County Community College who attended the march for the third time, believes the women’s marches have had an undeniable impact: "I think we have seen an impact from these marches. This past election more women ran than ever before and I think that women were energized by marches like these." Many marchers hope the enthusiasm from this year’s march will once again act as a catalyst to change. "After the march, I want to work with some groups to marry door knocking with voter education and registration so I hope to work on that for the next two years so that we have truly representative voices," said Stephanie Thomas, a veteran marcher from Connecticut. People from all different backgrounds and of all different ages attended this year’s march. Kamali Cooper, a 14-year-old from Miami Beach, traveled to New York City just so she could march and express her opinions. 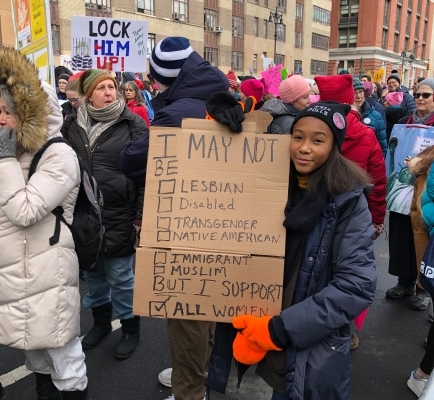 14-year-old Kamali Cooper at the Women's March in New York City on Jan. 19, 2019. "I think it is extremely important that young kids like me know that they have a voice and that they can be heard," Cooper said. The San Diego event also drew participants of all ages. Many mothers brought their daughters and sons. That included San Diego native Danielle Lauria, participating in the march for her third year in a row. She was there with her two daughters and a group of friends to secure a better future for her girls, she said. "I have two daughters and I want to make sure the world is a better place for my children and that they grow up with all the rights – that they have every opportunity that is possible," Lauria told NBC 7. She said bringing people together from all walks of life is at the core of the event, and it's what has kept her wanting to participate since the first march in January 2017. "We need more unification, and women need to feel like we’re equals. There’s nothing against men – we want everyone to be together, united and to work together," Lauria added. "I want my children to know that they can be strong, they need to voice their opinions, they need to be heard. We need to work together; we need to collaborate." 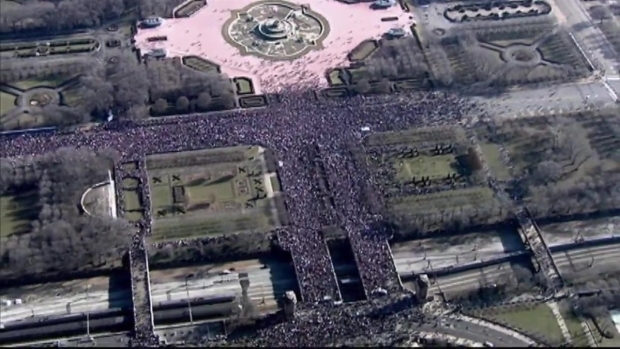 An estimated 250,000 people descended on the city for the Women's March on Chicago Saturday. Sky5 caught the view from above of the massive crowd at the rally. NBC's Emma Barnett and The Associated Press' Ashraf Khalil contributed to this story.